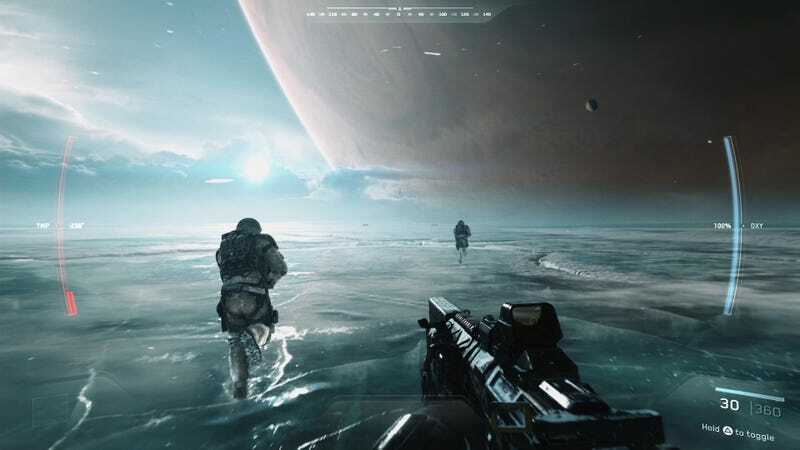 Infinite Warfare’s single-player campaign opens with a stroll across Europa. The sun glints off of the icy surface of Jupiter’s moon, the gas giant looming large in the sky. It’s a fascinating backdrop over which Call of Duty characters do very Call of Duty things. Since its official announcement and subsequent YouTube hate campaign, Infinite Warfare has been referred to as Call of Duty in space, and that’s exactly what it is. In the distant future, military acronyms have escaped the bounds of our fragile planet, expanding their reach throughout the solar system. One of these acronyms, the aggressive SDF (Settlement Defense Front), have grown large enough to challenge the UNSA (United Nations Space Alliance) for solar supremacy. When an SDF attack on Earth leaves the UNSA fleet crippled (maybe don’t hold Fleet Week with war looming), it’s up to Captain Nick Reyes and the crew of the warship Retribution to foil SDF Admiral Salen Kotch’s evil plans. Despite being assaulted by trailers and gameplay videos for months on end, I wasn’t prepared for the amount of space-based content Infinity Ward packed inside Infinite Warfare’s campaign. The first few minutes of the opening mission on Europa had me flashing back to the vintage pulp science fiction magazines I used to thumb through at conventions as a teenager. But this is a Call of Duty game, and that fantastic establishing shot soon gives way to more standard first-person shooter fare. The soldiers drop into a crevasse and make their way through an underground tunnel to find themselves in a much more mundane (albeit still futuristic) military complex. They try out some new toys of trademark pitched COD battles, like spidery seeker mines and anti-gravity grenades. They shoot soldiers and military robots both small and large. Eventually circumstances see the soldiers blasted back onto the surface, where they find themselves at the mercy of SDF leader Salen Kotch, played by Game of Thrones’ Kit Harrington. He is not very good. I mean Salen Kotch. Okay fine, I also mean Kit Harrington, whose idea of playing a villain seems to be the same as his idea of playing a hero, only slightly louder. Thankfully the rest of the cast makes up for Harrington’s overall lack of charisma. Brian Bloom’s Captain Nick Reyes is every bit the pulp science fiction action hero, a commander who’s not afraid to lead the charge into dangerous situations despite no doubt having countless underlings he could and probably should be sending instead. He shares great chemistry with Jamie Gray Hyder’s Lieutenant Nora Salter, and don’t think I missed the Nick and Nora reference in a game called Infinite Warfare, Infinity Ward. I see what you did there. It’s this pair of characters that regularly participates in one of Infinite Warfare’s coolest new features, channeling the spirit of Wing Commander. Players are regularly tasked with taking Nick’s Jackal starfighter out to play, battling SDF forces with a combination of missiles, machine guns and determination. It’s a very Call of Duty sort of space combat, faster and more destructive than traditional sims. Machine guns tear other ships to shreds in seconds, missiles more of an annoyance than a major threat. There’s an awful lot of spaceship-based combat in Infinite Warfare. What I expected would be a quick one-and-done novelty, like a glorified turret sequence, is actually a staple of Infinite Warfare’s mid-game. Equipped with a warp-capable battleship, players are able to take on space combat and ship infiltration side missions, gathering perks and equipment that might give them an edge in pivotal battles to come. Nick and Nora’s Infinite Warfare Playlist. My favorite gameplay moments in Call of Duty: Infinite Warfare’s campaign don’t take place in spaceships at all. You will believe soldiers equipped with small thruster packs floating in the icy depths of space can take a bullet without dying instantly. Infinite Warfare does a lot of daring things with its setting, but its boots are never far from the ground. For every zero gravity sequence there is a shootout in the streets of futuristic Geneva or the corridors of a moon base in which a ridiculous number of enemy combatants stand in relatively fixed positions and fire weapons until they die. There are only a couple of non-fodder enemy types, used whenever the situation calls for a major threat. Infinite Warfare’s campaign shines when it steps away from the established formula, and it steps away often enough to make the same old pitched battles interesting. I’ll gladly spend ten minutes killing a ridiculous number of enemy soldiers if the payoff is sights like this. Call of Duty: Infinite Warfare launches tomorrow for PlayStation 4, Xbox One and PC. Look for a full review in the coming days.